"Bodhisattvas at Ayutthaya." ... Heebner is interpreting and processing a bittersweet reality: Rampaging Burmese in the 17th century attacked the village and, in a final insult, decapitated its Buddhist deities. And yet the sacred sculptures remain, a testament to divine empowerment in the face of tragedy and defacement. 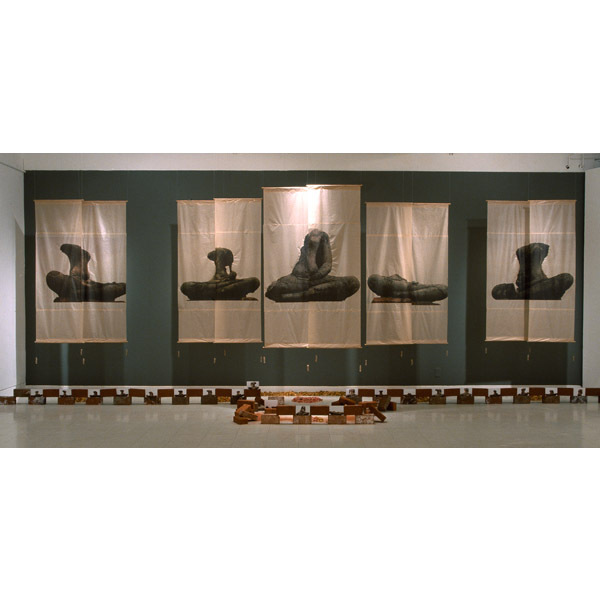 Heebner depicts these defaced Bodhisattvas in photos printed on sheer paper scrolls, and places a barrier of bricks and photographs on the floor, turning the sum effect into a shrine to spiritual resiliency."